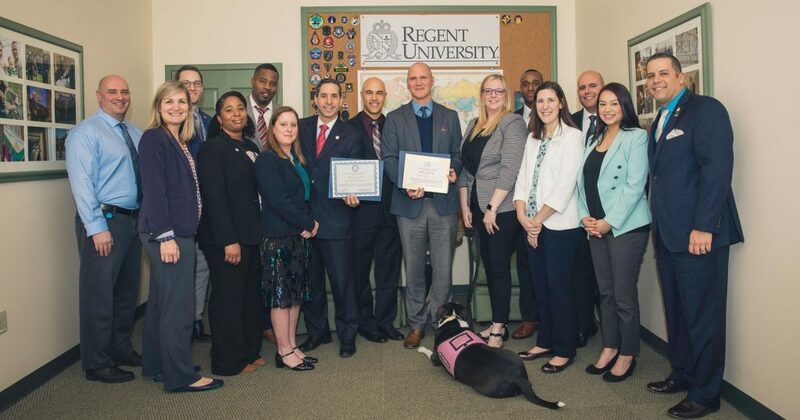 On Wednesday, March 28, representatives from the Virginia Department of Veteran Services (DVS) visited Regent University in celebration and recognition of Virginia Values Veterans (V3) and Training and Education Alliance (TEA) certificates the department awarded the university. The certifications, both of which stem from the office of the governor of Virginia, awarded Regent the certificates based on “commitment to the commonwealth’s veterans from an employment and educational perspective,” according to Bob Habib, director of Military Enrollment. Veteran Services representatives included Deputy Secretary of Veterans and Defense Affairs of Virginia Jaime Areizaga-Soto, V3 Regional Program Manager Mark S. Buehlman, Johanna Winters of Virginia Veteran and Family Support, Tim Bowden of Virginia Transition Assistance Program, and Lashanda Standifer of DVS Benefits. Amidst resources they discussed sharing via the new partnership, was a “collaboration with the newly created Air Force Cyber Command at Langley AFB,” said Habib. The resources could also include a direct line of communication to the policy makers for the commonwealth regarding veterans’ affairs, as well as access to the commonwealth’s distribution list for veterans’ services, Habib said. “We will also be working directly with the V3 team and the folks at the newly created VA Employment Commission workforce development center in Norfolk to set up regularly scheduled office hours to assist all veterans with educational and employment opportunities,” he added.